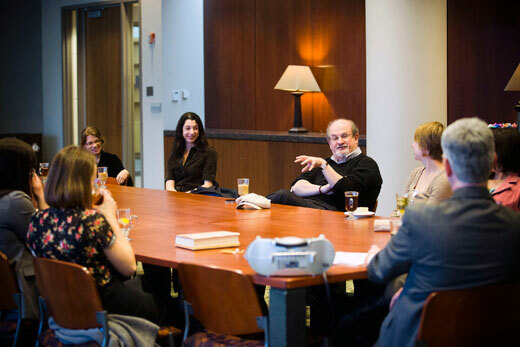 Salman Rushdie discusses music in literature with a group of library fellows at Woodruff Library. Emory Photo/Video. It's one thing to have acclaimed novelist Salman Rushdie show up in your Shakespeare class to lead a discussion about the great playwright's concept of tragedy. It's quite another to wind up face-to-face with the man, script in hand, sight-reading a scene from Shakespeare's "Othello" — with Rushdie eagerly portraying the scheming Iago to your besotted Roderigo. Salman Rushdie reads a scene from 'Othello' with Emory sophomore Andrew Mezher. "I'd never read 'Othello' before, so I was a little freaked out," admits Andrew Mezher, an Emory sophomore studying Renaissance literature and neuroscience, who says he was both surprised and impressed by the author's on-the-spot acting skill. "Instantly, he was in the moment, in the scene — what an amazing opportunity," says Mezher, adding that the experience prompted an immediate update of his Facebook status, which was quickly "liked" by his former high school literature teachers. Emory English Professor Sheila Cavanagh and Oxford College Assistant English Professor Kevin Quarmby had invited Rushdie to address "Shakespeare, Text and Performance" students from both campuses to explore "what one great writer has to say about another great writer," says Cavanagh. Rushdie's impromptu performance was an unexpected bonus, unfolding during a dinner with the author, who was visiting Emory recently in his role as University Distinguished Professor. For faculty, staff and students, Rushdie's presence affords unique, often lively opportunities, with a rigorous schedule that takes him across campus speaking on issues ranging from creative writing, books and film to violence, politics and religion — topics he knows only too well. When Debra Houry, associate professor at the School of Medicine and Rollins School of Public Health, and Pamela Scully, professor and chair of the Department of Women's, Gender and Sexuality Studies, were setting a schedule of speakers for this semester's University Course on Violence, Rushdie seemed a natural choice. "I asked if he could talk to our class about religion and violence," Houry recalls. "It couldn't have been more appropriate." For nearly a decade, Rushdie lived in hiding under police protection after the Ayatollah Khomeini renounced his 1988 novel "The Satanic Verses" as offensive to Islam. Khomeini issued a fatwa, calling for his death. In fact, Rushdie's Japanese translator was murdered, and near-fatal attacks were carried out on his Italian translator and Norwegian publisher. In the class, the author recounted what it was like "to see how easily people were receiving a description of me and my work essentially from pulpits and mosques and that seemed enough, to be told, to be pointed in a certain direction," he says, noting many of his detractors had never read the book. "It's strange for me, because I never thought of myself as being interested in either violence or religion, then it became interested in me," explains Rushdie, who quips that he actually grew up "in a pretty religion-free household, one of the great gifts my parents gave me." Rushdie recalls the weight of those difficult years in hiding in his 2012 memoir, "Joseph Anton," a pseudonym he crafted from the names of two favorite authors, Joseph Conrad and Anton Chekhov. His memoir became assigned reading in the University Course, where Rushdie spoke with authority on the historical persecution of books, religious martyrs, a recent wave of violence in India, civil rights movements, and the Arab Spring — a worldview that proved invaluable, Scully says. "It was very meaningful for our class to see someone whose life has been powerfully shaped by the threat of violence, as much as by violence itself," she notes. Scully was also interested for students see how such a threat could be transformed into art — in this case, a memoir. "Violence does not have to be a dead end of terror and sadness," she says. "Art can take terrible experiences and renew them in a totally different way." "Salman Rushdie's ability to converse across the terrains of politics, geography, literature and history speaks exactly to the kind of global literacy that I would like our students to develop," Scully adds. "He really is the embodiment of a liberal arts education." Both his memoir — created with the help of Emory's Manuscript, Archives and Rare Book Library's efforts to organize and make available his archive — and a soon-to-be-released film adaptation of his award-winning 1981 novel, "Midnight's Children," featured prominently in his Emory appearances this spring. "Midnight's Children" comes to Atlanta theaters in May. In some ways, this year's visit brings both projects full circle for Emory, says Professor and Chair of Film and Media Studies Matthew Bernstein, who values Rushdie's longstanding relationship with the University's film program. In 2009, Rushdie spoke at Emory about the creative challenges of adapting books into movies. In 2010, he came to campus with award-winning director Deepa Mehta to discuss making "Midnight's Children," which took four years to produce. This month, Rushdie joined Mehta and her husband, producer David Hamilton, at an advance screening of the movie at the Landmark Midtown Art Cinema, answering questions about the pleasures of collaboration and the political challenges of filming in Sri Lanka and India. "Three years ago, we were talking about ideas around adaptation — to see the finished film and be in on the excitement of that has been terrific," says Bernstein, who found the movie — coming to Atlanta theaters in May — "profound and visually stunning." "He's definitely a unique resource," Bernstein adds. "You have this amazing novelist of world renown who is also an intellectual, curious about ideas, about talking with people on an array of subjects. It could be film, literature or politics — whatever you're talking about, but particularly art and creativity, the perspective he brings is invaluable." "The global range he references is wonderful. His sense of humor is delightful. It's an incredible gift that he's here and so willing to engage with students and faculty and the life of a university," says Bernstein. "I've had students interact with him in class and tell me they've gone home to call their parents to say: 'I just had a conversation with Salman Rushdie!'" Whether discussing cultural shifts in India or exploring how to distinguish "between madness and revelation" during a graduate/faculty seminar on "Sacred Biography," Rushdie demonstrates his deep commitment to the art of storytelling. Speaking with Associate English Professor Deepika Bahri at the Halle Institute for Global Learning's India Summit, on "Joseph Anton and India," Rushdie acknowledged that after all these years, he is pleased to finally see people able to read "The Satanic Verses" simply as a novel. "It's having the normal life of a book," Rushdie said. With pleasure, he announced: Joseph Anton is, at last, finally dead. "Yes, very dead. Dead as a doornail. I killed him with pleasure — stake through his heart," Rushdie replied, adding that he welcomed a return to everyday life as himself, resuming such freedoms as being able to wait in line at public venues. Yet, beneath his own trials with "The Satanic Verses" remain potent, lingering questions: "Who has the right to tell a story? And who has the right to decide in what terms that story can be told?" Rushdie asks. "These stories, whether they're religious or not, belong to our heritage. Nation, family, religion — these are the grand narratives we all live within," he says. "My view is that we all have the right to tell these stories and to tell them in any way we choose."